Discover the awe-inspiring sights and fascinating traditions of Slovenia’s coast during a small-group day trip departing from Ljubljana. Start with a visit to Socerb Castle which rests atop a bluff and offers a glimpse over the Bay of Trieste. Head to the medieval Church of the Holy Trinity in Hrastovlje and witness its acclaimed fresco, Dance of Death. The tour continues to Sečovlje Salina Nature Park, where you stroll its historical landscape covered in salt flats. 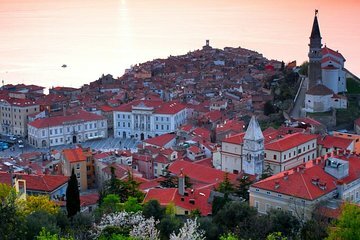 You also enjoy leisure time to explore the coastal sights in Koper and Piran. After meeting your guide in the morning at your centrally located Ljubljana hotel, hop into your air-conditioned minivan and journey to Socerb Castle. Arrive along a mesmerizing karst formation in the Šavrini Hills and capture views of the beautiful Adriatic and the Bay of Trieste. Learn about the Socerb Castle and its importance as a strategic stronghold to control the Trieste hinterlands. Next, move on to the remote village of Hrastovlje outside of the city Koper and visit the famous Church of the Holy Trinity. Learn about the origins of this church and why historians debate whether the church’s architecture is 12th century Romanesque or 15th century Venetian Renaissance. Then snap photos of the acclaimed gothic fresco, “Dance of Death” (Dance Macabre). Journey on to southwestern Slovenia and visit Sečovlje Salina Nature Park. See how salt is captured in ponds that cover 1,600 acres (650 hectares). During your 45 minute stroll through the flats, learn about the 700-year-old tradition still used to generate salt. Then, voyage north through the modern coastal town of Portorož to the Istrian town of Piran. Upon arrival, stretch your legs for a 1.5-hour walk through the medieval streets once roamed by Illyrian hill tribes and pirates. Stop for lunch (own expense) and perhaps try a traditional cuttlefish risotto. Finally, head to Koper and discover why its unique ecology and biodiversity makes it such an important national resource. Spend some time exploring and perhaps see Koper's 15th-century Praetorian Palace located on the city square. Meet back with your group shortly thereafter and return to your Ljubljana hotel where your tour ends. Great tour! Really great guide! Loved this tour. Was only three of us and we did everything in the itinerary had just come from two day trips in Vienna where this was not the case. Have to say that the medieval Church of the Holy Trinity in Hrastovlje was an unexpected highlight and would have been very difficult to get to on my own. The frescos were incredible and I had never been to a fortified church before. The salt flats were a little underwhelming but this was made up for by Piran, which is the main reason I booked this tour. Our guide was excellent and informative, though be aware that we didn't stop for lunch till 2:30, so you might want to pack some snacks. All in all, an excellent day that I would highly recommend. I really enjoyed my day trip to the Slovenian Coast. Our guide was very knowledgable and we learnt a lot about coastal Slovenia and the country in general. It was also interesting seeing the difference in vegetation and architecture between the coast and the capitol city. My favourite stop of the tour was Piran where we had a guided tour of the main sights and some free time I think it was between 1 and 2 hours. I liked that we had the tour so we already knew where most of the sights were and had some free time. So, I could enjoy the beach and a wander around town. Overall, I can only recommend this day trip. Tour is amazing, Ivana is a lovely and wonderful guide, we had a beautiful day, surely to come back again! Hvala! Excursion was excellent. Our guide, Tine, was extremely knowledgeable and entertaining. Various stops were well timed and paced. Would definitely recommend to anyone. The city Piran is amazing and suitable for people who enjoyed sea view and history. Our tour guide is extremely friendly and knowledgable. He makes the tour very comfortable and enjoyable. The attractions in the morning are average though. A great tour guide and good trip - enjoyment not dampened by the rain! This tour packs a TON into a single day. I liked every stop, though some might think it's too much for one day. Sanda was a wonderful guide...so personable and friendly, and really made sure I was getting the most out of the day. Be sure to pack a swimsuit if you're visiting in the summer and want to make time for a quick dip. I had time for a brief swim in Koper and Piran and the water was fantastic! Fantastic guides and wonderful selection of events!